All in all, 42 has a handful of admirable qualities, but sometimes it can’t avoid some of the typical tropes of the biopic. 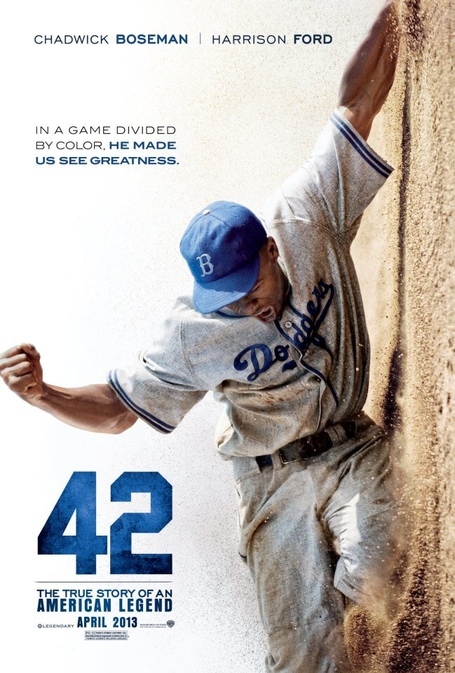 I guess that’s what happens when you take on a genre as old as Hollywood itself… This movie tells the story of Jackie Robinson, who overcame much prejudice to break the MLB’s all-white roster in April 1947 when he signed on to the Brooklyn Dodgers. He’s played by Chadwick Boseman here, who inserts a kind of power into the story of someone that many know simply from the history books. Robinson was discovered by Dodgers GM Branch Rickey (HARRISON FORD), and through a brief period with the Montreal Royals, the 26 year old was seen fit to become an efficient player, and it would have been just a regular passage had Robinson not been the first black MLB player in the 20th century. Oh, the vicious reception from the public in general, and from other baseball people, including Philadelphia Phillies manager Ben Chapman (ALAN TUDYK), who infamously layered minute after minute of verbal abuse at Robinson during the second baseman’s first month with the Dodgers. What bugs me the most about 42 is its apparent fear to be anything more than your typical historical drama. There’s your fair share of swelling music and slow motion shots, with the obligatory title cards at the end explaining what happened to the figures portrayed. Nevertheless, it must be said that this is still a well produced movie. Writer/director Brian Helgeland has an impressive roster, and with 42 he delivers a mostly solid screenplay along with expert direction, with only the occasional falter of an overtly emotional slow motion sequence from time to time. Besides Boseman, the acting is very good down the board, with a notable performance from Ford. Warner Bros. probably had a bit of debate on whether releasing 42 at the start of baseball season (April) or awards season (October – December). Even if it had opted for the latter, I don’t know if much more would have happened with the accolades, as I can’t really say a lot other than a medium grade recommendation, like I mentioned before. I suspect a majority of those reading this will have some kind of interest in the story, as civil rights and sports can attract a wide variety, and even the better when they overlap. There’s not really a lot of ways where you can’t admire Jackie Robinson, thus making him perfect biopic material. He didn’t take on his hecklers with hostility, because that would only feed their assaults. His life story is quite fascinating, and Helgeland does some good work translating it to the screen. 42 is a good movie, and I don’t think you’d be disappointed if you went to see it. It does well in all major tests of filmmaking, just not exuberantly well. It projects itself loud and clear, but never excessively.